Hope everyone is having a safe holiday weekend. 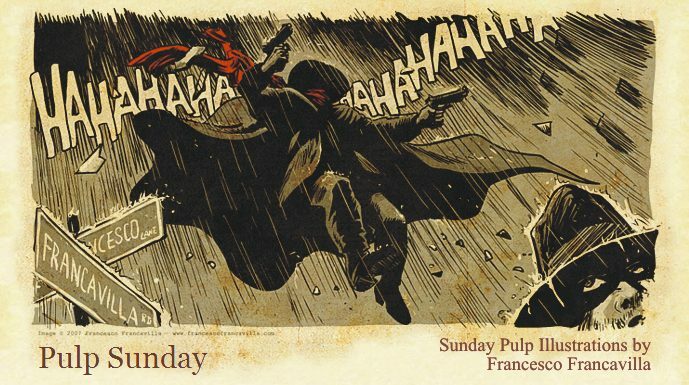 Yes, i have been developing this concept since the last time you guys have seen it here on the pages of Pulp Sunday. Can't tell much more at the moment, but I thought to take some time this morning to put together the cover/poster you see above. Hope you guys dig it and wish you all a wonderful holiday weekend. EDIT: I did a slightly different version and I am a bit torn now on which one works best: the above cover is simpler and maybe stronger, but the new cover might be more eye catching (plus recalls a bit - faded - the colors of the flag). U.S.R.A. (United States Robot Army) created, TM & © 2010-2011 Francesco Francavilla. Scientist Tak Nan Lee resumes work on the desperately needed Atmosphere Plant as he tries to befriend the Red Martian woman he rescued from the Green Horde. Meanwhile, thousands of Greens march on the White Martian city of Thark! The story that tells the fall of Barsoom 100,000 years before John Carter continues! Here are a couple of retro Bond posters I did some time ago: "Dr. NO" and "Quantum of Solace". Hope you guys dig 'em. After my variant covers for HELLBOY THE FURY #1 and BPRD MONSTERS #1, it's time to reveal my third variant cover I did for Mike Mignola's wonderful creations. This time it's the turn of BALTIMORE, the character created by Mike Mignola and Christopher Golden in novel format and then extended (luckily for us) to the comibook format. Monsters are overrunning Europe, and Baltimore, the only one who can put an end to these horrors, must find and kill Haigus, the vampire responsible for this chaos. Following reports that Haigus is holed up in a cloister, Baltimore finds a haven full of death and black magic, and the creature at the heart of his obsession! • Based on the novel by Mike Mignola and Christopher Golden. 100,000 years before the time of John Carter! Barsoom is a dying world: its once mighty oceans are receding and its atmosphere grows more tenuous by the day. The Orovars, who have dominated for a million years, are on the verge of extinction at the hands of the Green Hordes and the emerging Red Martians. Two Orovars - a Scientist and a General -- race against time to save their people before Mars plunges into barbarism! fighting brotherhood, La Justicia, and a score of Native American fighters. As the good guys muster their forces, Colonel Barton and his renegade bushwhackers man their Gatling gun for the defense of the Chumash mission. The stakes couldn't be higher: the lives of innocent women and children, the future of an entire culture, and the legacy of the hero known as Zorro.